The South West is full of enchanting corners and beautiful escapes, places where you can share those special (and sometimes momentous) moments with your significant other. If you’re thinking about whisking away your Valentine for a romantic rendezvous, then look no further than Toad Hall Cottages and its flourishing list of cosy boltholes, charming hideaways and secluded retreats. For all you lovers out there preparing to go down on bended knee, here are some truly, madly, deeply romantic settings, all of them irresistible targets for Cupid’s sweet arrows. It’s believed to be the oldest tree in the New Forest, its majestic boughs and mighty trunk having withstood the tests of five hundred years or more. The Knightwood Oak stands in a quiet glade close to the beginning of the spectacular Bolderwood Ornamental Drive, one of the most ancient parts of the New Forest. Where better to betroth than in the dappled shade of one of Dorset’s most venerable residents. Our next setting is as dramatic as it is romantic, an iconic harbour wall in the picturesque seaside town of Lyme Regis that became the location for one of the most striking scenes ever to hit the cinema screens. I am, of course, talking about The French Lieutenant’s Woman starring Meryl Streep and Jeremy Irons as the star-crossed lovers whose stormy paths collide on the brooding Dorset coast. Eponymously based on John Fowles’ best-selling novel, this classic love story won a string of awards and remains one of the most successful films of its era. Known as ‘The Cobb’, this famous stretch of harbour wall is sure to ignite your passion. It’s one of the Jurassic Coast’s most photographed landmarks, an incredible limestone arch that’s been carved out by both time and the elements. The ancient rock formation known as Durdle Door near Lulworth Cove has for centuries captivated all those who gaze upon it, a giant and mesmerising keyhole to unlock the hearts of young lovers. Pick a quiet time and walk along the shore at sunset to see the sun’s ebbing rays glinting through the archway. Let your passions soar when you reach the south coast’s highest vantage point. With views across Lyme Bay stretching as far as the brooding wilds of Dartmoor, the giant rocky shoulder known as Golden Cap is sure to invigorate your senses. When you reach the 627-foot-tall summit you’ll feel like you’re on top of the world…just make sure you don’t forget your sparkly ring if you’re planning a lofty proposal atop of this amazing Dorset cliff crest!! You won’t find a more majestic setting than the magnificent Golden Cap. The unrivalled beauty of Bigbury Bay has made it one of the most popular settings for a romantic walk. Follow the ancient footpaths and green lanes from the pretty, rural village of Ringmore to discover the breathtaking views along the Avon Estuary before arriving at one of South Devon’s most cherished stretches of coastline. Explore the sandy beaches of Bigbury, Challaborough and Ayrmer Cove, and if the tide is right, cross the sand bar to Burgh Island, a tiny tidal outcrop famous for its Art Deco hotel and smugglers’ inn and once the inspiration for detective novelist Agatha Christie. This gorgeous corner of the South Hams is guaranteed to make your hearts go aflutter. Anyone who has read the prolific words of Henry Williamson and his heart-warming story of Tarka the Otter will be thrilled by a visit to North Devon’s ‘Two Rivers’. The Tarka Trail leads you along some of those evocative backwaters so wonderfully brought to life in Williamson’s work as he charts the life of a young, adventurous dog otter during his most famous of books. A picnic below the weeping willows on the banks of the River Taw could be the perfect spot for love to blossom. Our next romantic setting is hidden away in the heart of one the region’s most dramatic landscapes and harnesses the magical and healing powers of wild running water. 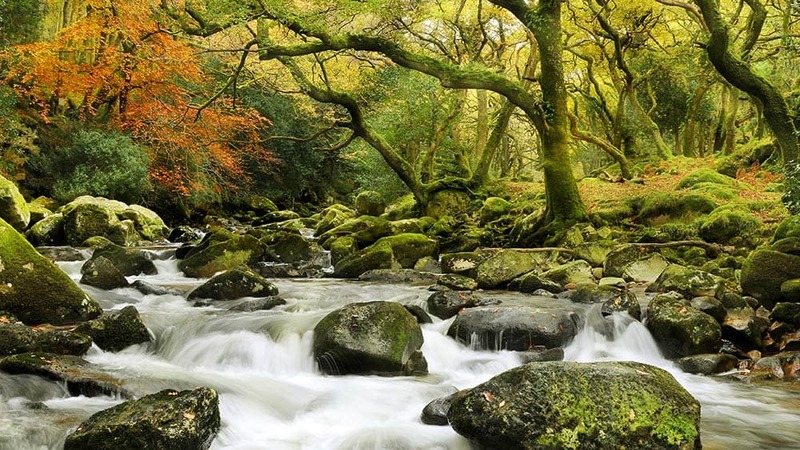 Carved out of ancient granite rocks during the last Ice Age, Becky Falls is surely one of Dartmoor’s most enchanting places. Here, on the banks of the rushing Becka Brook under the gnarly boughs of some of the moorland’s most ancient trees you can declare your undying love. Whisk yourselves away to the sparkling waters of Mount’s Bay to walk the ancient cobbled causeway on the ebbing tide where you’ll discover one of Cornwall’s most spectacular landmarks. Steeped in myth and legend, the tidal island of St Michael’s Mount remains one of Cornwall’s most hallowed grounds. Site of an impressive medieval church and towering castle, you’ll also enjoy captivating views of the surrounding coast while exploring the secret corners and quiet alcoves to be found along the narrow halls and winding passageways of this island fortress. Lovers take note; by the side of the chapel, at the island’s summit, the mount’s bedrock is clearly visible: it’s here, upon this sacred stone, that wishes for a lasting love can be made. In fact, many young suitors have laid their hands upon the bedrock before delivering a proposal of marriage. 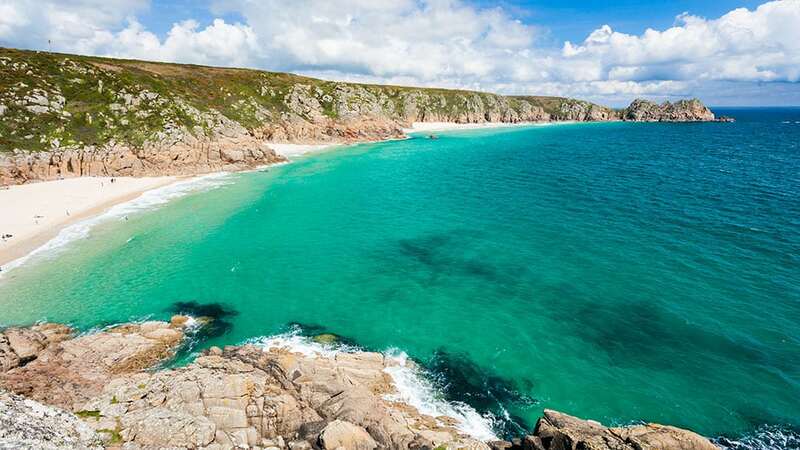 The soft, white sands and aquamarine waters of Porthcurno Beach remains one of the treasures of the Cornish peninsula. This much-loved coastal sweep plays host to the legendary Logan Rock, an 80-ton menhir perched upon the clifftop to be gazed upon by the swimmers below. Also to be found in this blissful corner of ‘Kernow’ is the Minack Theatre, a famous venue shelved into the cliffside where you can enjoy world-class theatrical performances to the backdrop of the sparkling Atlantic Ocean. On a beautiful blue sky day there’s no better place to be! If you’re feeling particularly cavalier, gallant or chivalrous, then Tintagel Castle is sure to satisfy your wildest Arthurian fantasies. 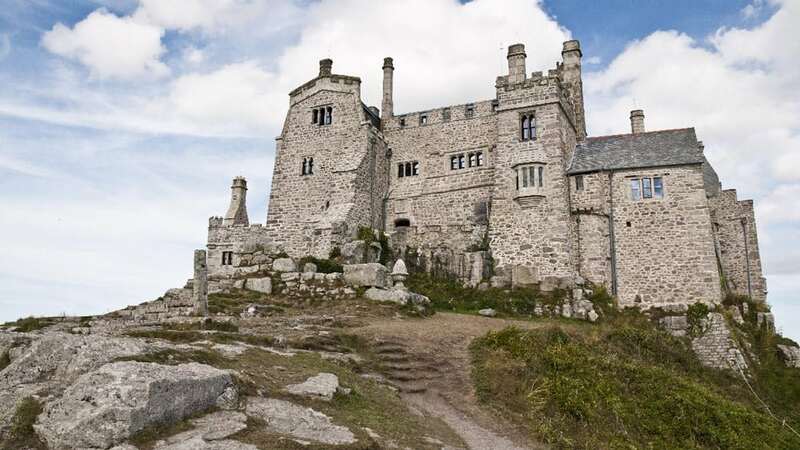 These incredible ruins on the clifftops of North Cornwall are steeped in myth and legend, with majestic views at every pass – the inspiration of writers and artists down the centuries. Walk in the fabled footsteps of King Arthur and Queen Guinevere when you spend some quality time together on this glorious and magical headland.